worth a thousand words. give or take. Access to information is unlike it has ever been before. We learn about events happening around the world within seconds, from the likes of Twitter, Youtube, (media conglomerates are behind the curve) email, and so on. And then there’s the instant availability of every single bit of knowledge there is – a quick google search can reveal the answer to nearly any question – I wonder how this will affect our children? Daddy is no longer the all knowing – If and when I confess not knowing the answer to something, my young son directs me to “try googling it dad”. As soon as the kids are in 1st grade they learn about using Google and other tools for researching information. Do I even need to say that the days of hitting the rows of Encycopedias is dead?! Will it benefit children to learn more about everything they want to know…when they want to know it? Or will they lose out by not learning the lessons as they try and fail in their attempts to get it right? 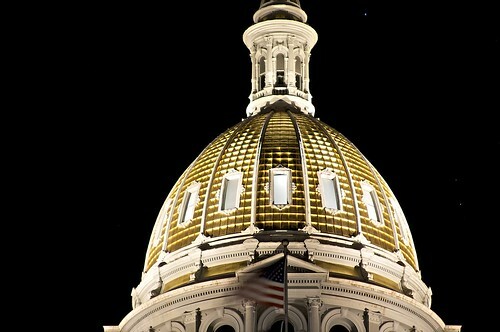 After shooting the Denver City building lights over the holiday, made my way over to the Capitol building and got this shot.